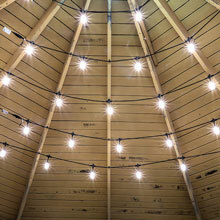 This commercial grade LED outdoor light string will transform any space into something wonderful. 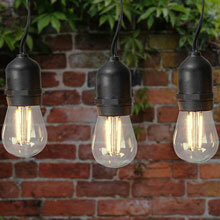 Add a touch of charm to any outdoor or indoor space. 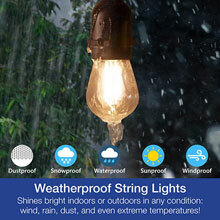 This heavy duty light string is great for any occasion. 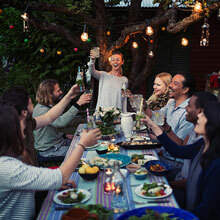 Use them for weddings, barbecues, parties, holiday or just to add romance to your outdoor space. The strong durable construction of these make them able to withstand all types of weather, while the unique vintage style filament LED bulbs provide energy savings. Over 48' long with a 7" drop. 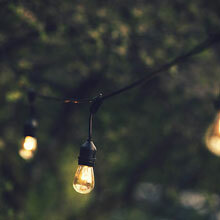 •CREATE YOUR OWN RETREAT: These Italian bistro style lights will transform any patio of yard into a relaxing retreat, perfect for entertaining or a romantic dinner, use multiple strands to create your own look. 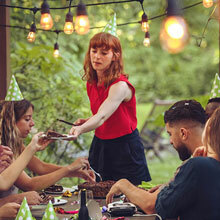 •RETRO DESIGN: With Edison style LED bulbs, perfect to use a canopy lights for wedding receptions, birthday parties or other festive occasion; these lights can also be use indoors in bedrooms, bars or restaurants. 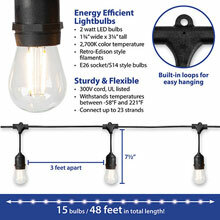 •DURABLE CONSTRUCTION: The heavy duty commercial grade weather proof light strand is perfect for any exterior, the UL listed rubberized cord is thicker and more substantial the other string lights, perfect for year round use; 48 feet long with a 7 inch drop. 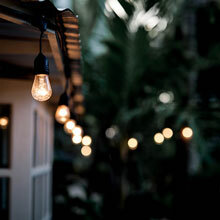 •ENERGY SAVINGS: These bulbs might look like retro filament Edison bulbs but they are really high efficiency 2 watt LED bulbs with standard bulb bases, cool to the touch and saves on your power bill. •GREAT FOR: Weddings, celebrations, birthdays, decks, patios, porches, yards, gardens, bedrooms, bars, sun rooms or restaurants.